We've been on some kind of diesel haze induced bender over here on DT (starting with that SWEEET Ford Falcedes) I was going to title this next post "if Dodge had built trucks" and then somebody nudged my elbow and told me "Dodge DOES build trucks". "GET BACK INTO YOUR CLOWN CAVE, YOU FREAK" I screamed at what I hope was a hallucination brought on by my lack of sleep. But first pour me another bourbon, and tell me about this Dodge truck thing. 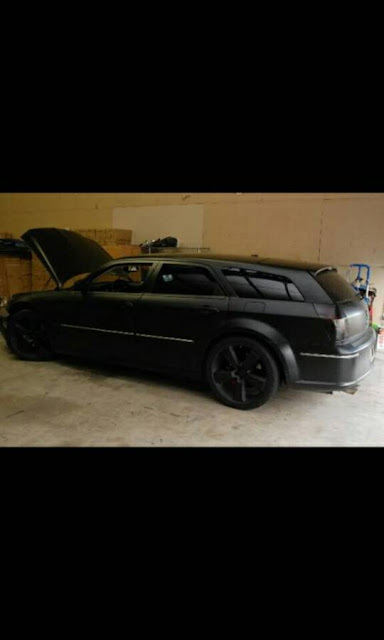 Find this 2005 Dodge Magnum with Cummins 6BT Power offered for $10,000 in Santa Maria, CA via craigslist. Tip from Sean. This ad has all of the things that make for a classic craigslist advertisement -- one lo-res picture that misses all of the stuff a potential buyer might want to see. Trade or buy. I have a 2005 dodge Magnum engine swap. Cummins 12 valve. New heads. Hamilton pushrod and spring with ARP 425 head studs. Garrett gt5518r turbo. 88mm compressor wheel stage 2 nitrous kit and bigger jets. Twin glass pack. 2 much to list just got a 2jz twin turbo and going into a 300zx no need for Magnum. Have a mechanic come look at it. Have snap on tool to check engine if you would like. Just need a new project so I need room. Bully dog stage 3 clutch to much to list call or text. Awd. Interestingly enough, someone else has done a similar swap on the Charger version of the car -- read about it here. Can you imagine how confused the smog shop would be? An engine that came in a truck that didn't need to be smogged into a car that has to be. Not that I want to test it but diesel exhaust contains no carbon monoxide (CO). What, the one fuzzy, distant snap shot was not enough to go on? I figure peeps with the proclivity to stuff a diesel motor into clapped out Dodge Magnum is not spending much time with a thesaurus. Or spell check. Probably a vast number of "engineering" shortcuts abound. My overall hunch is that lumber plays some role in mounting the drivetrain into the wagon. The sight of timber in a car project usually kills the enthusiasm. Imagine "The transmission is kept in place with a pressure treated 6X6." The guy may be smarter than he appears to be. >> My overall hunch is that lumber plays some role in mounting the drivetrain into the wagon. All that and only one valve per cylinder. I actually really dig the Magnum and was looking for a nice used one before I picked up my car a few months back. The problem was that they either had too many miles or was so pristine the owner wanted too much... much like the Caddy CTS-V wagons.